Now that I’m a bonafide, certified scuba diver and about to finish my advanced certification, I think it’s time to come clean: I’m obsessed with scuba diving. 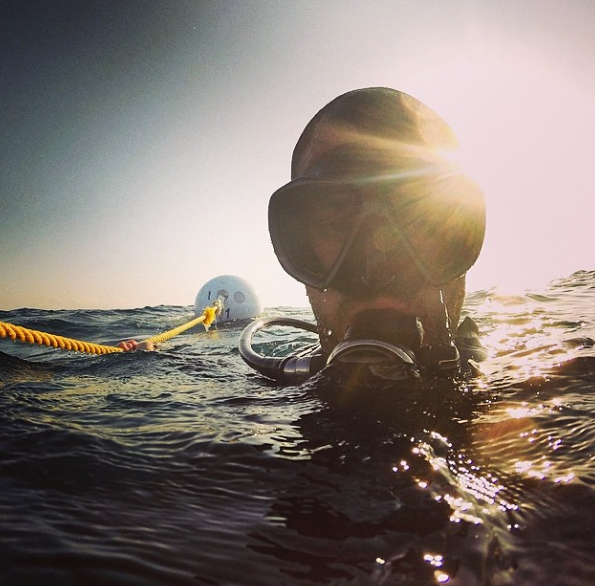 Though I just started scuba back in November, I already have several dives behind me, and my buoyancy and comfort in the water has greatly improved, scuba has truly become a great release for me. It’s perfectly quiet down there – no phones, no computers, no TV- and I feel almost meditative, as though I’m at one with nature. Coming up for air on one of my latest dives in Miami. Though I’m still a scuba newbie, I’ve gotten to dive in some amazing places including the Maldives, the Great Barrier Reef and Grand Cayman, and I only regret not taking up scuba earlier in life. That just means I’ve got to make up for lost time…and I’ve been doing my best so far! 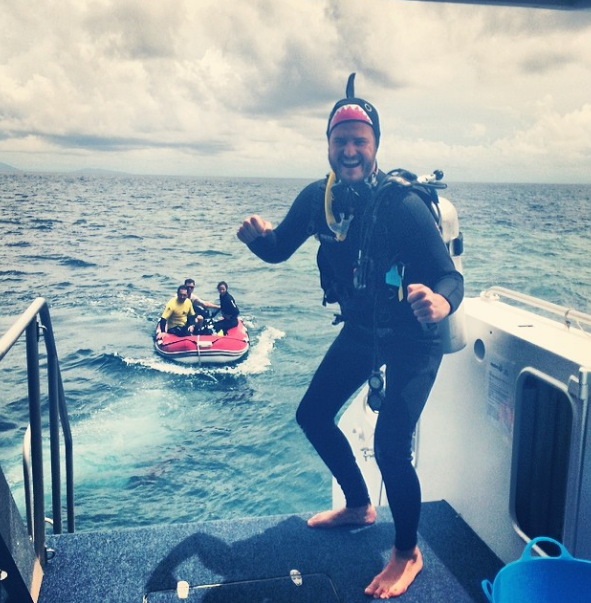 Here have been some of my top scuba experiences. Feel free to share your own in the comments. 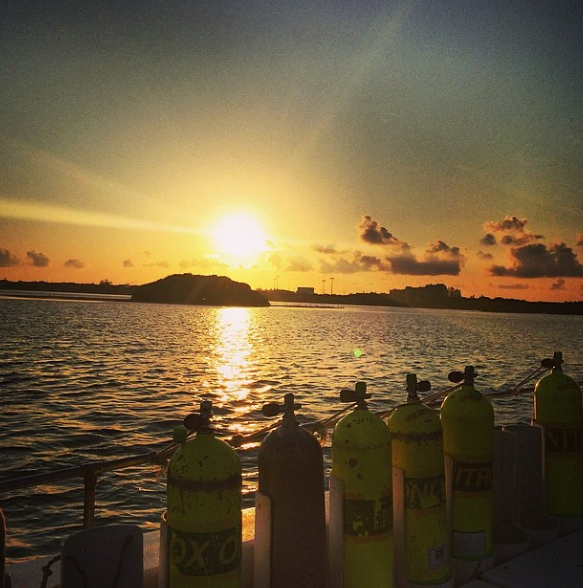 Each of my dives has been its own special rush, but some have had a, um, deeper effect on me. (Get it?) From the surface to the floor, these are how I’d rank my dives so far. 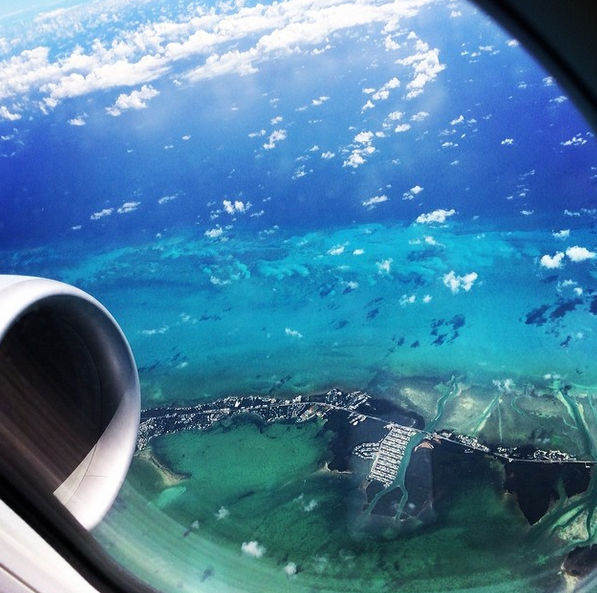 This is what the water around Grand Cayman looks like from the air – just imagine what it looks like from underneath! 1. Grand Cayman. This Caribbean island sits on top of a submerged mountain range, and the scenery in its enormous canyon drop-offs absolutely blew my mind. The wildlife spotting wasn’t stellar – I only saw a couple of sharks and turtles – but diving in these canyons through ridiculously clear waters felt like entering an alternate reality, almost as though I was in a video game. I loved diving beside soaring walls full of tunnels and caves, all of which are covered with bumpy, spiky and round corals in every color you can imagine. 2. 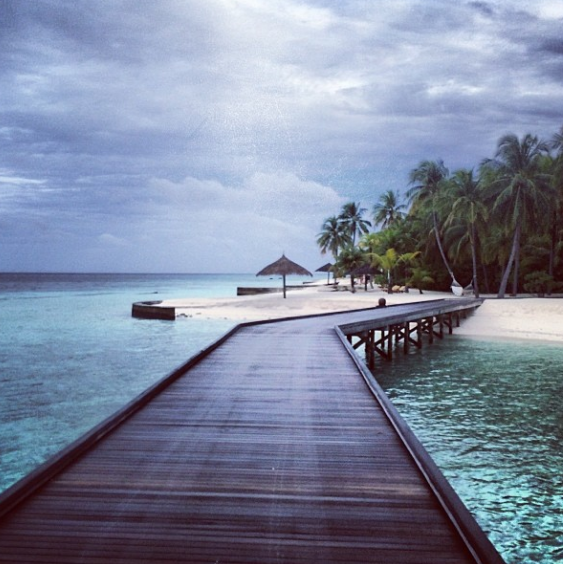 The Maldives. A close second to Grand Cayman, I only visited a few of these nearly 1,200 Indian Ocean islands set 600 miles southwest of Sri Lanka, but while diving in the pristine water around them I saw white-tip reef sharks, crabby moray eels and tons of incredible fish and corals. My favorite experience was also one of the most surreal things I’ve ever seen: a huge manta ray circled slowly above me for a solid 10 minutes. 3. Costa Rica. During every dive of my December 2013 trip to Costa Rica’s west coast Gulf of Papagayo, I encountered so-so visibility – but great wildlife. On my last dive of the trip (and the year), I hung out next to a reef shark longer than me (see the video above! ), swam with a sea turtle, spotted two spotted eagle rays, gawked at a bossy moray eel – and so much more. 4. The Florida Keys. 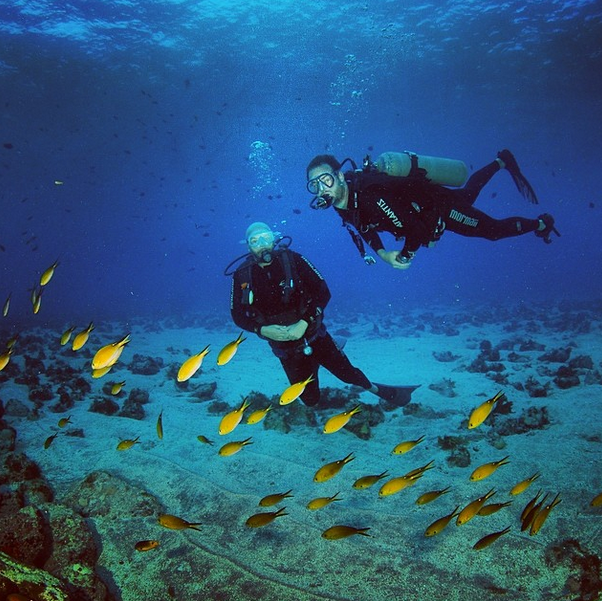 I love diving in The Keys because they’re so close to my home in South Beach, but I especially love diving off Key Biscayne, because the visibility is almost perfect – it’s a great spot for beginners. Visibility in the Keys isn’t always so good, but there are tons of wrecks to explore and reef wildlife to see. I’ve done most of my training dives here, and two of them were open water dives in Key Largo’s John Pennekamp Marine Sanctuary, which has the largest living coral reef in North America, full of fish like wrasses, parrotfish, damselfish, grunts and even barracudas (who, thankfully, aren’t all that interested in people). 6. Fernando de Noronha. Two hundred miles off the coast of Brazil, closest to the northeastern city of Recife, this collection of 21 tropical, volcanic islands form the top dive spot in the South Atlantic. Part of a major sea life migration path to Africa, Fernando is known for schools of spinner dolphins, marine turtles, gentle sharks, and visibility up to 30 feet. We had some decent diving here when the choppy spring weather permitted, but the main attraction for me was visiting such an out-of-the-way place and getting a feel for real island life for a few days. Lugging around and tugging on a wetsuit, gloves and weight belt can certainly be a pain, but staying safe is absolutely worth the hassle. While 60 feet below the water’s surface at Grand Cayman, I accidentally cut myself on fire coral and started to bleed, which meant I had to end that gorgeous dive way ahead of schedule. When descending for my deep water certification in the Keys, I unfortunately grabbed onto some barnacles and fire coral (I think you’re sensing a theme here) and my hands stung for about a week. Then in the Maldives, I got stung by jellyfish when diving without a wetsuit. Bottom line – it’s better to be protected! One of the most unexpected benefits of diving is the layer of depth it adds to my travel experiences. By getting to know what a destination looks and feels like below the water’s surface, the more I feel I understand that part of the world. While diving, I’ve met great people from all around the globe, and some of the most fun have been my dive leaders themselves. Going out on a dive makes it easy to meet locals, who can give you a deeper insight to your destination and steer you towards the best places to go. 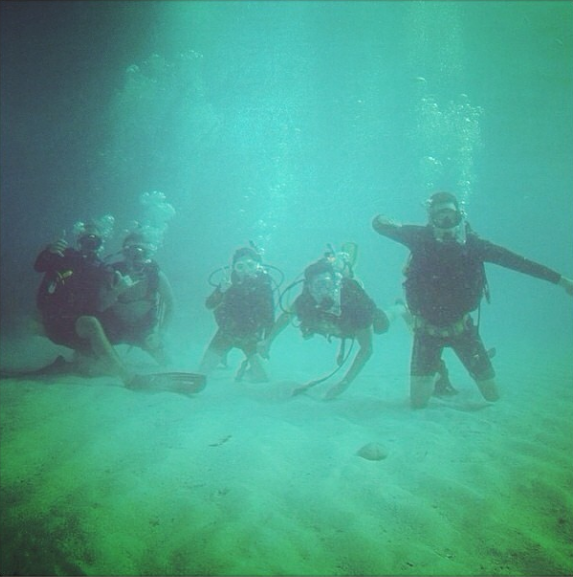 Scuba diving is by no means a cheap hobby, but it’s definitely one I plan on doing for a long, long time. Have you been bitten by the scuba bug, too? If so, please share your favorite experiences and dive sites in the comments!